With President Obama taking a more populist approach to health care reform, the battle over his top domestic priority was the No. 1 story for the third week in a row. 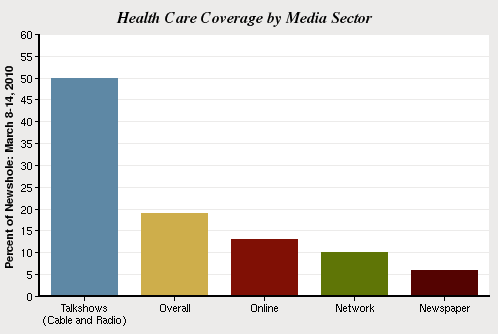 From March 8-14, the health care debate filled 19% of the newshole, according to the Pew Research Center’s Project for Excellence in Journalism. The narrative was driven by Obama’s impassioned approach as he took to the road and sharpened his attacks on the insurance industry. The latest spike in coverage began with the televised health care summit on February 25 and gained additional momentum on March 3 when Obama announced his desire for a vote within weeks. The other big domestic issue, the state of the U.S. economy, was the second-biggest story at 12%, marking the third straight week it has been the No. 2 item on the news agenda. Last week’s storyline was dominated by the troubled financial sector and the jobs market. The continued controversy surrounding departed Democratic Congressman Eric Massa was the third-biggest story (5%) last week. In the wake of charges of sexual harassment, Massa last week hit the talk show circuit. But rather than clearing his name, he stirred up more controversy with an on-air confession. The No. 4 story was the continuing trouble for Toyota (5%), marking the fourth time in seven weeks that the carmaker has made the roster of top-five subjects. But last week, there were signs of a shift in tenor as skepticism emerged about some of the claims against the company. The No. 5 story last week was one that rarely generates significant attention in the News Coverage Index. Stories about education filled 5% of the newshole. This was driven in part by the White House’s efforts to revamp the nation’s school system including the No Child Left Behind legislation. The two big domestic issues topped the charts again last week, with some media sectors giving precedence to health care and others to the economy. At 19% of the newshole from March 8-14 coverage of health care was up slightly from the previous week (18%) and down moderately from the week before that (24%). Last week, the subject was driven by mostly ideological talkers, filling 50% of the airtime in the 10 cable and radio talk shows studied by PEJ. Those programs tend to focus most intently on hot button political issues, and with the legislation heading for what is widely seen as a cliffhanger vote in Congress, the coverage in the talk shows and elsewhere focused on health care politics with the President as the top attraction. On the March 8 edition of the PBS NewsHour, the commentators discussed the administration’s ramped-up criticism of the insurance industry. James Morone, chairman of the political science department at Brown University ventured that it was a strategy born out of necessity given the success of the bill’s opponents. When it comes to the economic crisis, coverage lately has been nothing if not consistent. This was the fifth straight week in which the subject generated between 10% and 13% of the overall newshole. In newspapers and online it ranked No. 1 at 24% and 14% respectively. A variety of events tied to the financial sector and the jobs picture made headlines. One such story involved Lehman Brothers, the once powerful financial firm whose bankruptcy in September 2008 helped trigger frantic efforts to bail out Wall Street. For the second week in a row, Congressional scandals ranked among the top five stories, accounting for 5% of the coverage from March 8-14 and generating its most attention in the cable sector (13% of the newshole). Two weeks ago, Democratic Congressman Eric Massa, who resigned amid allegations of sexual harassment, shared the spotlight with Democrat Charles Rangel, who resigned as chairman of the House Ways and Means Committee while under investigation on ethics issues. Last week, the focus of the coverage was overwhelmingly Massa, who made highly publicized appearances with CNN’s Larry King and the Fox News Channel’s Glenn Beck and was spoofed on Saturday Night Live. Massa, who alleged he was pressured out of office by fellow Democrats angry at his opposition to the health care bill, made the most news with his appearance with Beck, taking “full and complete responsibility for my misbehavior” and admitting he tickled a male staffer till he could not breathe at his 50th birthday party. The fourth-biggest subject, at 5% of the newshole, featured more questions about Toyota cars. But last week’s coverage involved another element, suggestions that perhaps some of the allegations against Toyota were overblown. Indeed one such report, by California resident Jim Sikes who said his Prius had accelerated to over 90 miles per hour, generated media skepticism after tests by investigators raised doubts about his version of events. The fifth-biggest story, education issues (5%), got a boost from Obama’s efforts to change school standards and generated the most coverage in the newspaper sector (9% of the front-page newshole). But there were a number of different storylines last week, ranging from school systems facing a budget crunch to efforts to ban laptops from the college classroom, with supporters of that idea claiming they represent a distraction and an impediment to learning. From March 8-14 Barack Obama, who took his health care pitch on the road, was the top figure in the news, appearing as a lead newsmaker in 6% of the week’s stories. (To register as a lead newsmaker, a figure must appear in at least 50% of a story.) But that’s not a particularly large amount of weekly coverage for the President and represents a drop from 8% the previous week. The No. 2 newsmaker, Eric Massa, (5%) generated a lot of unflattering publicity last week after his media tour seemed to raise more questions about his behavior and credibility. He was followed by Colleen LaRose, (2%), more commonly known as Jihad Jane, the U.S. native and Philadelphia-area resident who was arrested on terrorism-related charges. 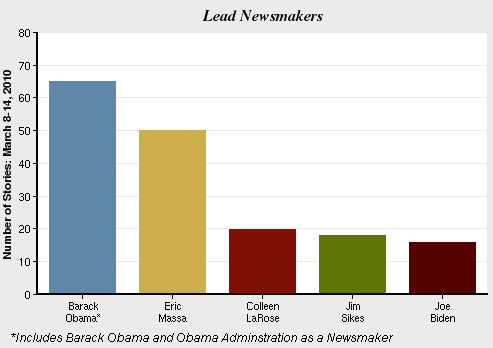 Jim Sikes, who claimed his Prius accelerated out of control and found his story under scrutiny, was the fourth-biggest newsmaker, also at 2%. And finishing just behind him was Vice-President Joseph Biden (2%), who was visiting Israel when that government announced a major new construction project in disputed East Jerusalem territory, precipitating something of a crisis in U.S.-Israeli relations.